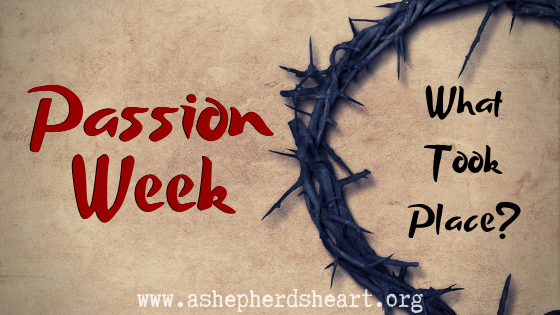 Passion Week is an incredible time where we should pause to remember all Jesus did and endured for us so that we can have forgiveness and life in and through Him! The following is a straight forward list of some of the many things that took place from His triumphant entry that we remember on Palm Sunday and on through to Resurrection Sunday with scriptures for your personal reading, study, reflection, and prayer. May you be moved to praise The Lord all the more as you re-read, study, and reflect on these passages this week as remember all He did and endured for you! Spiritual Warfare: Submit, Resist, and he will Flee! Some time ago, I went through a Spiritual Warfare 101 Bible study (by Chip Ingram) with a small group/community group that met every other week. We need to look at and treat spiritual warfare Biblically and not let our emotions overshadow what is or isn't spiritual warfare. We need to guard against over-spiritualization of important and very real matters such as this. Remaining Sharp In A World That Aims To Keep You Dull. Many times we may have gone to use a knife to cut something. It may have been a pocketknife to carve something; or maybe a kitchen knife to carve your Thanksgiving turkey or some other food item. There have been times when you went to use the knife of your choosing and you may have found that the knife was so dull that a butter knife would have probably been more effective. You then either had to sharpen the knife, maybe taken it somewhere to get it sharpened, or see if you had another knife you can use instead. Even after we have sharpened the knife, it will likely becomes dull again because most knives need constant maintenance to stay useful for their given purpose. Like these knives, we need constant sharpening in order to stay useful and to actively grow as we strive to become complete in Christ. -A growing relationship with The Lord. -Abiding in, reading, studying and living out God's Word. -Allowing The Holy Spirit to work in your life. -Growing with The Body of Christ doing life together as each of us play our individual parts as part of The Body serving God and each other. God has given us all the tools and resources we need and as we actively utilize these tools and people God has placed in our lives no matter through times of trial or times of peace, we will continued to be sharpened. As we do life together, God allows friction to take place and with this friction we should become sharpened as the dull edges we have in our lives are smoothed away. What a joy and privilege it is to be used in helping sharpen others and to be sharpened by others. It is sad though, that many choose to remain dull just because they don't want to put out any effort and would rather remain isolated from others and thereby miss-out on the growth they can experience or help others experience! One of the many blessings about our walk with the Lord is that He uses people around us, right where you and I are, to sharpen us. 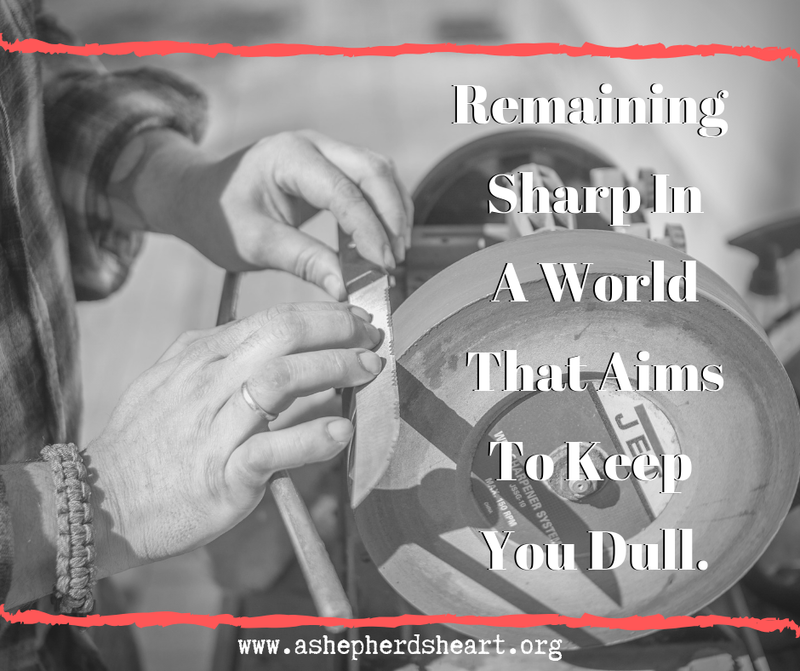 Are you a sharp or dull knife? We can think of a "sharp" Christian as a believer that isn't perfect but is actively growing in their relationship with the Lord, helping others grow...being a disciple who makes disciples. Someone who is on the alert against satan's attacks. Their faith and walk doesn't begin and end on Sundays, rather, they actively live out their faith in Jesus and strive to help others do the same day-to-day. On the flip side, we can think of a "dull" Christian as a believer that has become ineffective or stagnant in their relationship with the Lord and others and may have become satan's prey as they have given in to this world and his influence. They may be a "Sunday only Christian" that does their "Sunday thing" but leaves church like a "check of the box" of weekly activities and they rarely live out their faith in Jesus. The truth is that we either do things God's Way or we don't. Furthermore, the world and the enemy of your soul is more than happy to distract you from staying sharp. I pray you strive to remain sharp in a world that aims to keep you dull. The choice is up to you and I pray that you will allow Him to sharpen you for His Kingdom, Glory, and the good of The Body of Christ! Strive to be sharpened and to help sharpen others in Jesus name. -Are you a sharp or dull Christian? -Which would you rather be? -How do you become sharpened? -What will you do to stay sharp? -Do you help sharpen others? -Do you allow God and others to help sharpen you? -Is all of the above important to you? -As a Christian why should this matter and why should these passages matter? Read: Ephesians 4:22-24, Proverbs 25:28, 1 Corinthians 9:25-27, Romans 14:13-23, Ephesians 6:12, 1 Peter 5:8, 1 Corinthians 6:18, and Luke 9:23. 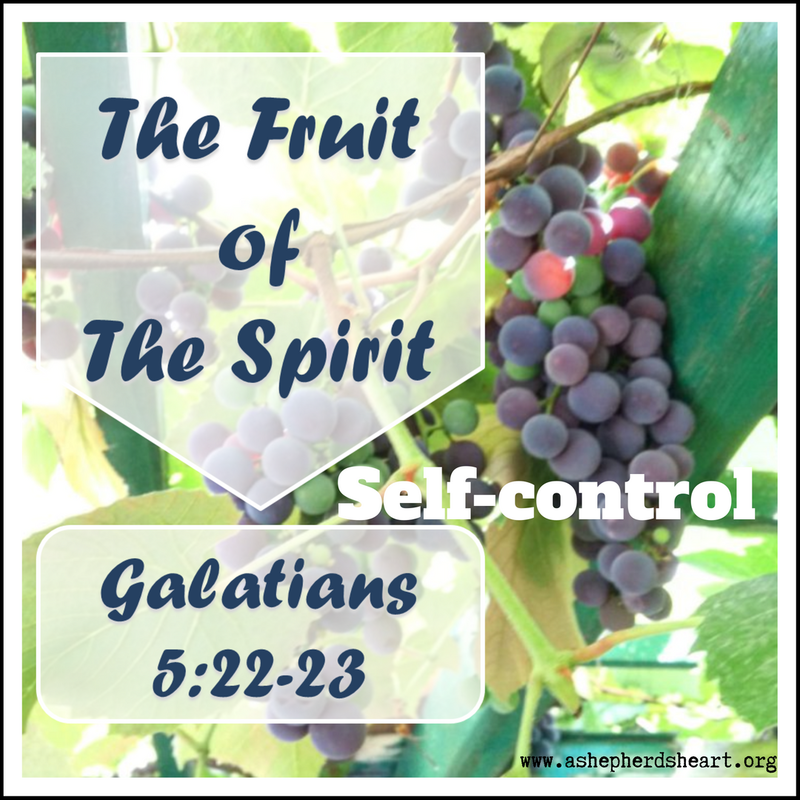 We desperately need more self-control in our world as it seems to be such a tumultuous time where so many are lacking this character quality and Fruit of the Spirit. If we’re honest we see that we live in what is a largely self-centered, entitled society that wants what they want no matter what anyone else wants. It’s a ”me” or “I” viewpoint. However, those who know the Lord, should be abiding in Him, and walking in the power, help and direction from the Holy Spirit…we are to put off our old life, put on the new life and shift our focus off ourselves and onto the Lord and others! Tenacity – synonyms are persistence, determination, perseverance, doggedness, strength of purpose, tirelessness, patience, purposefulness, steadfastness, staying power, endurance. Like before A Football Game, Wrestling Match, or music competition or one of the many musicals I was a part of…There was this ownership and feeling that accompanied those ongoing things. This tenacity translated onto the sports field or music stage and was a driving force to continue to grow and excel. 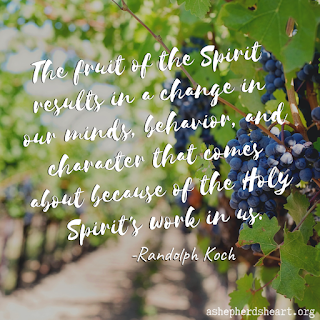 I believe that while it is The Holy Spirit that brings about gifts that are The Fruit of The Spirit, we are to be tenacious in growing in Christ and allowing His Spirit to work in and through us! The ability for you and I to say no the things which aren’t good for us or others. The ability and desire to put off the old life and put on the new. The denial of our selfish desires and the striving after God’s purpose, plan and will. Self-Control is important because we really cannot grow to be more Christ-like without self-control. Furthermore, as we work hard to control our thoughts, words and actions, we provided proof that God is at work in and through our lives and we have to put on the armor of God regularly because there are many things that can hinder self-control. 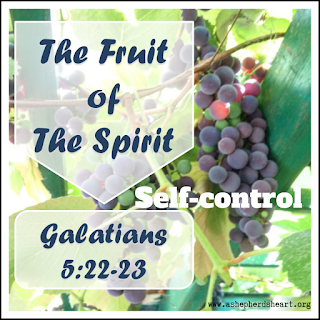 It seems that with every other Fruit of the Spirit that it takes some measure of self-control to fulfill each of them. Love, joy, peace, patience, kindness, goodness, faithfulness, and gentleness. I recall reading about Edmund Hilary who was the first man who conquered Mount Everest, (29,029 feet tall & is earth’s highest mountain). He was asked by an interviewer about his passions for climbing mountains. He gave this reply: "It is not the mountain we conquer but ourselves." Self-Control is largely the conquering of ourselves but the most amazing thing is that we don’t conquer on our own…we have God’s help every step of the way. Proverbs 25:28 says, "Like a city whose walls are broken through is a person who lacks self-control." This is especially relevant to the times where they had fortified cities. I wonder if you and I see people like this verse describes? People whose life’s are like broken old dilapidated houses? If we do, it’s because they haven’t maintained their physical and spiritual house. The analogy is even more relevant when you’re a home owner, however, if you're in Christ, He’s rebuilt the temple and taken residence up inside of us. We are no longer that broke down house in Christ and we have to fortify ourselves through abiding in Christ and His Word so we can face the day-to-day battles so we won’t succumb to the pressures the influences that wage war against us. As we read 1 Corinthians 9:25-27, we see that this passage is a picture of Self-Control and we’re reminded that our prize is eternal life with Christ. We don’t run this race without purpose / aimlessly because He gives us a greater purpose to live and run this race He’s placed ahead of us! Note: He says here that He disciplines his body and keep it under control. We need to do the same including controlling our minds / thoughts. We also have to remember once again that our actions can positively or negatively impact others. In this case…our actions, words, attitudes can cause others to stumble in the area of Self-Control. As Romans 14:13-23 reminds us, we should not be a stumbling block for one another. We are also constantly under attack so self-control is needful in our lives and others. Another rampant thing in our world is immorality and as follower's of Christ, we're called to flee immorality which also (See 1 Corinthians 6:18) takes self-control...and sometimes in life…you will not only have to figuratively flee…but you may have to physically flee what it is that is detrimental to you. I want you to remember something: your conduct matters now and in the future. Whatever you do today can set precedence for your future whether positively or negatively. We can cause our own obstacles for progress when we choose to do the things which we know will adversely impact ourselves and others. We aren’t called to live a perfect life but we are called to strive for holiness, including striving to be more Christ-like. Self-Control takes a lot of work. It takes a tenaciousness to be committed to your pursuit of Christ and in pursuing Him, allowing His Holy Spirit to work in and through you to help you bear fruit! If you want to grow in this or any of the Fruit of The Spirit, you need help! So, ask the Holy Spirit for help! In order to successfully grow you need to also abide in Christ each day! You need to own your growth and pursuit of Christ. I also suggest that you assess the things and people that are influencing your life. Consider if there are friends, settings or things you need to avoid going forward as they negatively impact you and cause you to struggle with self-control? Are there things or people that may be tempting you or causing you to stumble? If so, it's time to purge those people or things. This may sound hard nosed but, sometimes this is exactly what you need to do successfully grow! Let me also encourage you to be tenacious and own your words, actions and thoughts. 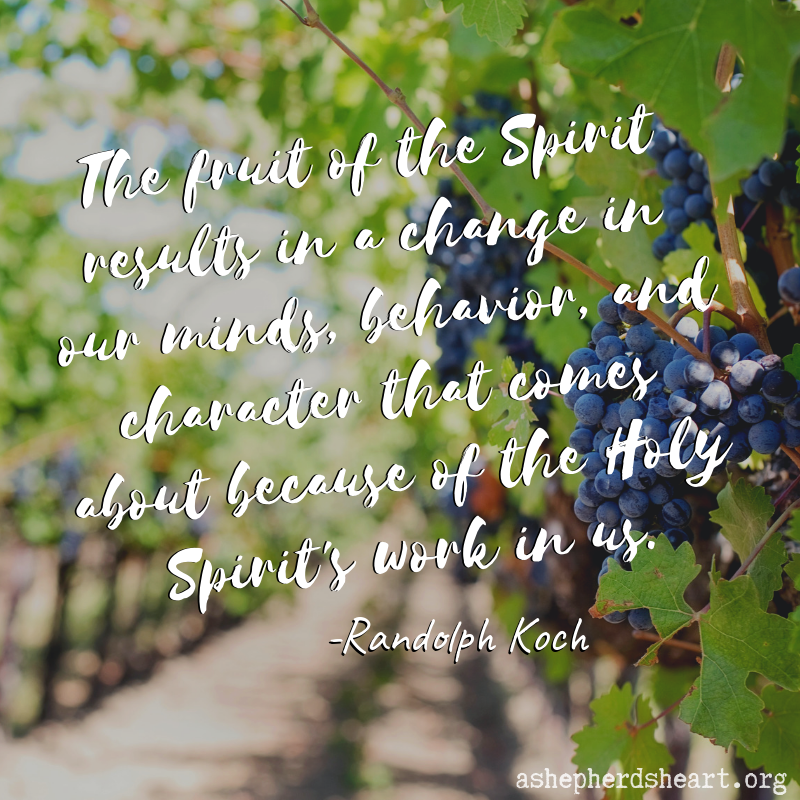 The Fruit of The spirit results in a change in our mind, behavior, and character that comes about because of the Holy Spirit's Work in us! May you enjoy celebrating the love of God through His Son Jesus each and every day! If I speak in the tongues of men and of angels, but have not love, I am a noisy gong or a clanging cymbal. And if I have prophetic powers, and understand all mysteries and all knowledge, and if I have all faith, so as to remove mountains, but have not love, I am nothing. If I give away all I have, and if I deliver up my body to be burned, but have not love, I gain nothing. Love is patient and kind; love does not envy or boast; it is not arrogant or rude. It does not insist on its own way; it is not irritable or resentful; it does not rejoice at wrongdoing, but rejoices with the truth. Love bears all things, believes all things, hopes all things, endures all things. Love never ends. As for prophecies, they will pass away; as for tongues, they will cease; as for knowledge, it will pass away. For we know in part and we prophesy in part, but when the perfect comes, the partial will pass away. When I was a child, I spoke like a child, I thought like a child, I reasoned like a child. When I became a man, I gave up childish ways. For now we see in a mirror dimly, but then face to face. Now I know in part; then I shall know fully, even as I have been fully known. 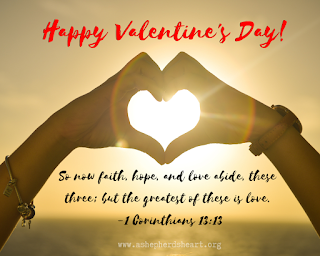 So now faith, hope, and love abide, these three; but the greatest of these is love. When doubt-filled questions and accusations a hurled at you, speaking truth to yourself from God's Word is vital. It's vital no matter the season. The truth is that the enemy and others seek to tear you down, but, they forget Whose you are and Who you are in Christ! You tend to forget sometimes as well! We all are faced with times of doubt and times where the enemy and others seem to be on the attack. During this times we need to remember that through Christ we are His and through Him we are Secure, Accepted, and Significant. WE ARE CHILDREN OF THE MOST HIGH GOD! 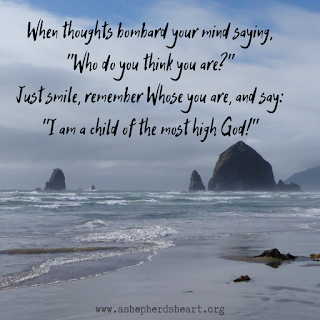 I recall a season when one of my kids were not seeing themselves for how God sees them and they were really down on themselves while listening to the wrong voices. In the moment, I had them stand in front of the mirror and speak truth to themselves instead of believing the lies they've been told. I wanted them to see their own reflection and remember Who they reflect as we're made in His Image. They needed to remember Whose they are and we all need to remember this! We are nobodies who know SOMEBODY! Jesus Christ! You have to decide which voice you are you going to listen to. God's Voice - The One Who is for you? Or the world's voice - those who are often against you? Friend, remember Whose you are and cast out any doubt or negative voices and speak His truth over yourself instead of the doubts and lies in Jesus Name! 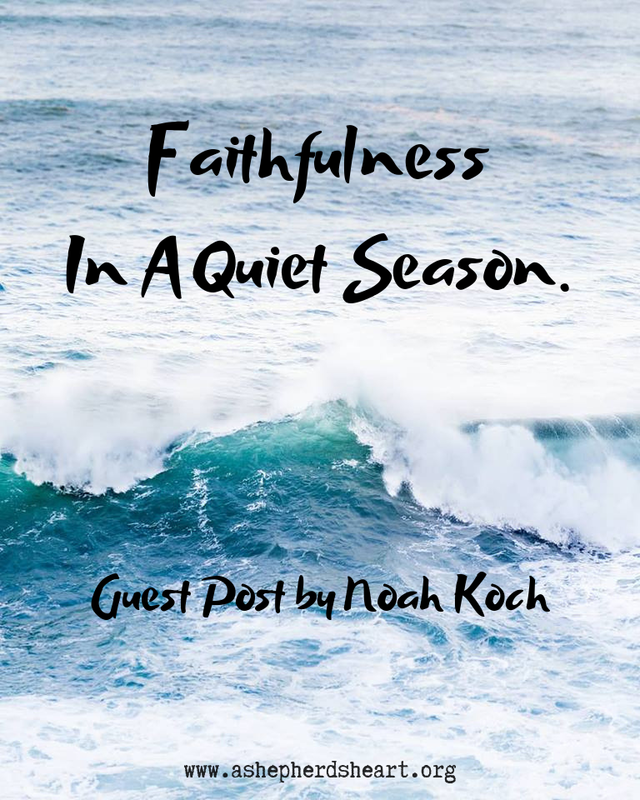 When you're in a season of trial and growth, sometimes it can be easy to slip into doubt mode. You may have even prayed and prayed and God seems "Silent" or you're wondering "Where is He? 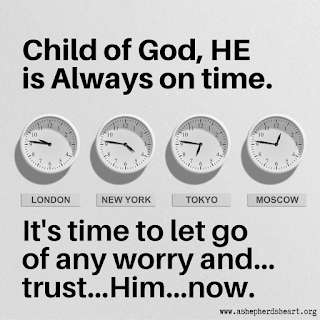 ", or, "When it God going to show up?" Let me encourage you to not listen to those voices because based on God's Word and even your own past experiences, you know God is always on time - no matter what! The negative voices you hear and the dialogue that goes on in your head during these seasons is a product of doubt and not a product of faith. Hold on to faith and reject all the negative voices of doubt...including the whispers of the enemy or other people. 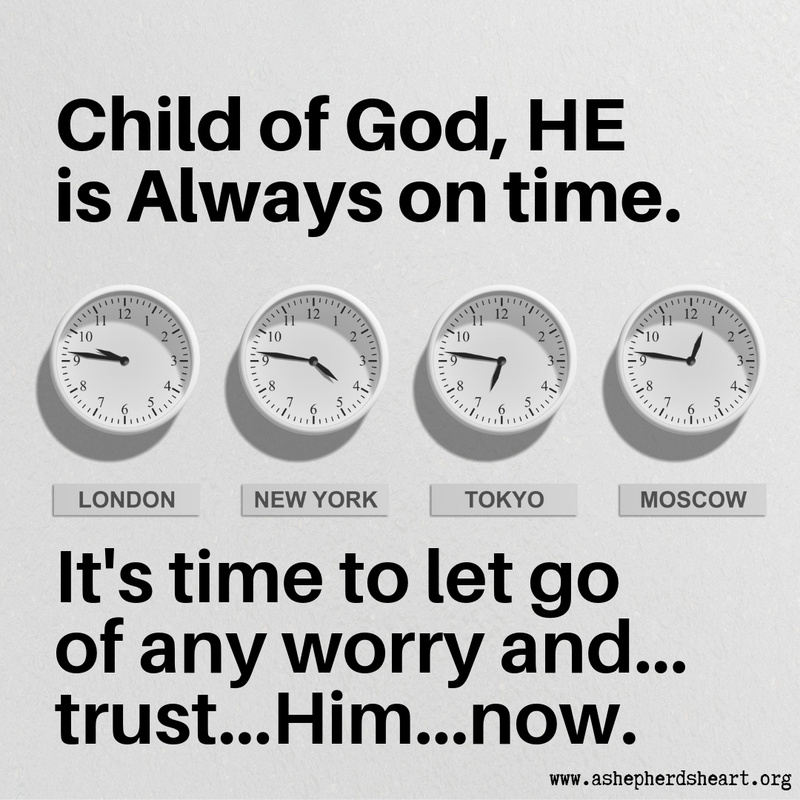 God always shows up in His perfect timing so don't spend anymore time worrying and shift your faith into "high gear" as you know God is your rock always. Read the following passages and be encouraged: 2 Peter 3:8-9, 1 Peter 5:6-8, James 4:13-17, Psalm 23:4, Matthew 6:25-34, Proverbs 3:5-6, Romans 5: 1-5, and Isaiah 41:10. 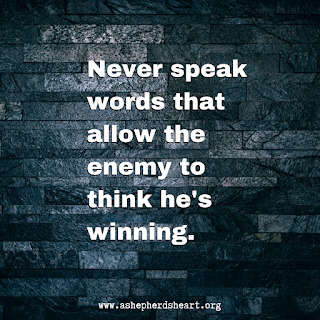 Do you find yourself speaking negative or defeating words to yourself or others? 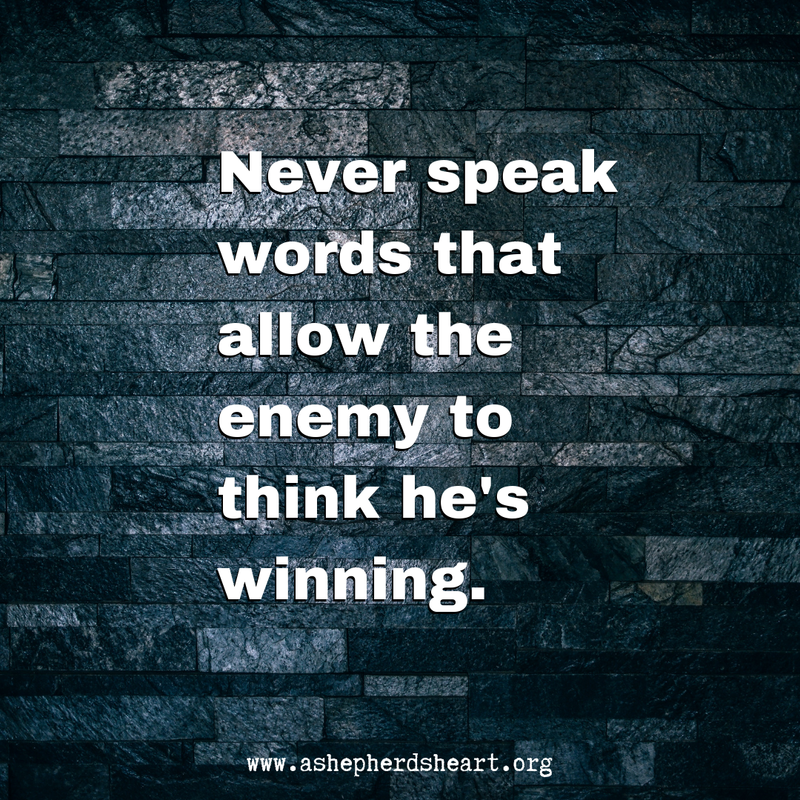 Do you speak words that often tear down? #2 What does the scripture say about our words and what kind of words we should speak? #3 In Christ, Are you a victim or a victor? #4 Would you rather speak or receive life giving words or the opposite? I pray God helps us speak words that are acceptable to Him and as much as possible, brings life to the hearers...including ourselves. Here are some of the many scriptures about our words and how they truly matter. Lets work hard at choosing our words wisely as our words truly matter. May we strive to speak words that build up and don't tear down. Lets speak words of life! 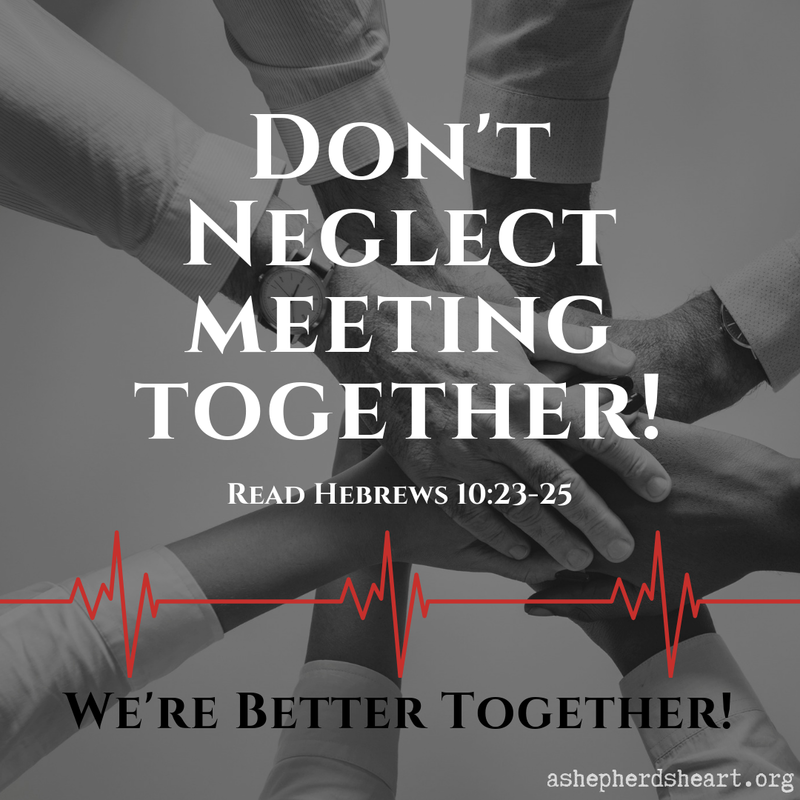 Do Not Forsake Assembling Together: We're Better Together! Read: Hebrews 10:23-25, Romans 12:3-8, 1 Corinthians 12:12-27, Acts 2:44-47, Acts 4:33-35, and Proverbs 27:17. God's Word teaches us that from the very beginning it is by His design that He never intended mankind to be or do life alone. You can check out the first several chapters of Genesis for instance where He didn't want Adam to be alone so He created Eve. Furthermore, Adam and Eve had a direct relationship with God as well because they, like all of us where create for relationship with Him and others. 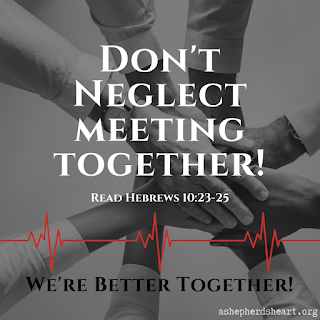 Woven through out the Old and New Testament we see God placing an emphasis on relationships and specifically in the New Testament He exhorts us that we are a part of the body of Christ and we play a specific part in relationship with others. While it may not always feel like it, we are truly better doing life together. And together, we are a part of something greater than ourselves.